I frequently lament the lack of crepe stands in Downtown Mountain View, so I was pleased that a restaurant called “Crepevine” was setting up shop; when I noticed it had opened its doors today, I figured I’d go in and buy a crepe to eat on my way home. The restaurant looked pleasant enough once I got in, with a slightly more diverse menu than its name suggested. Which, actually, led to the first warning sign: I couldn’t even find a nutella and banana crepe on the menu, and when I asked about it, they said they had it, they just called it the ‘Monaco’. Maybe there’s a reference there that I’m missing, but as is it feels like a slightly inappropriate renaming of a culinary standard? And the second warning sign was that the crepe cost seven bucks; I decided to give it a try, but that’s expensive enough that it’s certainly not going to be any sort of regular habit for me. That is not suitable for me to eat while walking home. (Or while walking to the train station, or while wandering around downtown after dinner.) 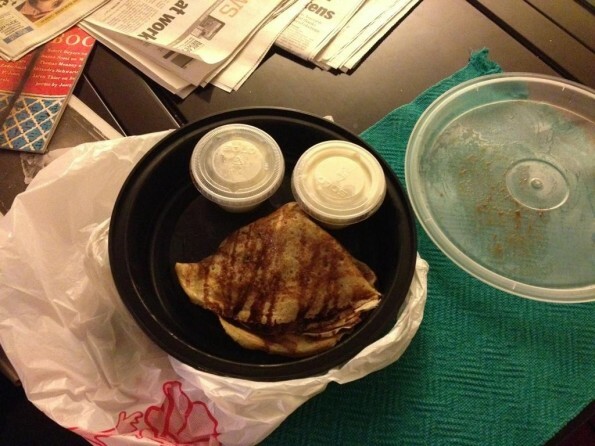 And I wasn’t any more impressed when I got home: the crepe wasn’t warm (no idea how warm it was when I got it), it wasn’t particularly good (not actively bad, just mediocre), and those containers contained ice cream and whipped cream that were both superfluous and poor quality. So: the food snob in me recoils. The restaurant isn’t focusing on the basics of making a good crepe, and they’re adding unwanted geegaws (both culinary and nomenclatural) to that indifferent start. Food snobbery aside, though, it’s an interesting lesson of “job to be done” theory: I was hoping to hire the food as a pleasant snack on the way home (and have wished in the past that I’d had that food to hire as a dessert to munch on while wandering around downtown), but the packaging, pricing, and toppings all worked to make it inappropriate for that task. Now, there’s no reason why this particular restaurant should have as its goal to fill that niche. And, indeed, if the niche it’s trying to fill is a low-ceremony place to have a sit-down meal, then what they’re doing is more appropriate. That price, though, still seems odd to me: much better desserts at more expensive places on Castro still top out at around $7, so aren’t they overshooting a bit? I imagine rents on Castro aren’t cheap: they have a cost structure that they have to make work. But that’s not my problem, that’s theirs. Which actually reminds me of the recent news in the iPad magazine space: The Daily announced that it was going to close, while The Magazine looks successful so far. It’s not that The Daily didn’t get subscribers—it apparently got millions of dollars in subscription revenue—but its cost model didn’t let them be successful with that amount of revenue. The Magazine, in contrast, has much smaller overhead. My wife and I went to Crepevine recently for breakfast, but we dined in. We thought it was pretty good, though a bit crowded and chaotic, not surprising for a place that had just opened. I’m not too particular about crepes themselves, but I’d venture that a crepe restaurant gives a different experience from a sidewalk crepe stand. I guess you were expecting the latter. BTW where do they have those? Paris? Well, I wasn’t exactly expecting the latter, but I was hoping for something that could get me the same benefits. And yeah, crepe stands are all over the place in Paris; locally, there’s a place in Japantown center that is decent, and if memory serves me well (it’s been most of a decade), I think there’s a creperie north of campus in Berkeley that does good crepes to go? And it’s not obvious to me that Mountain View couldn’t support something like that. Glad to hear they’re a decent place for dining in, at least.